Chaussée de Courcelles 115, 6041 Charleroi, Belgien. 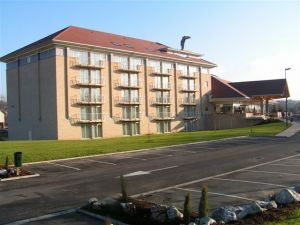 Hotel Charleroi Airport offers an infrastructure of 80 rooms on five floors in the heart of a 1.5 ha area. Ideally located along the A54 motorway which leads directly to Brussels, the ambition of Charleroi Airport Hotel is to meet the expectations of an demanding and varied business clientele. Internetleistungen und WiFi sind kostenlos vorhanden.Es gibt Internetleistungen (Computers) in der Vorhalle (gegen Zahlung). Weniger als 1 Tag(e) vor Anreise : die vollständige Reservierung zu zahlen. Our bar "Le Lindbergh" and our restaurant "Le Zeppelin" are available every day from 12.00 am till 10.30 pm. Room-service is open from 7.00 am till 10.30 pm. 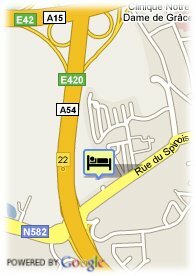 Hotel Charleroi Airport is 5 km away form 'Brussels-South Charleoi-Airport' and a few minutes from the city-center.